Be sure to take advantage of the 30% Federal Tax Credit before it goes away at the end of the year. There is LIMITED TIME available to get this credit. 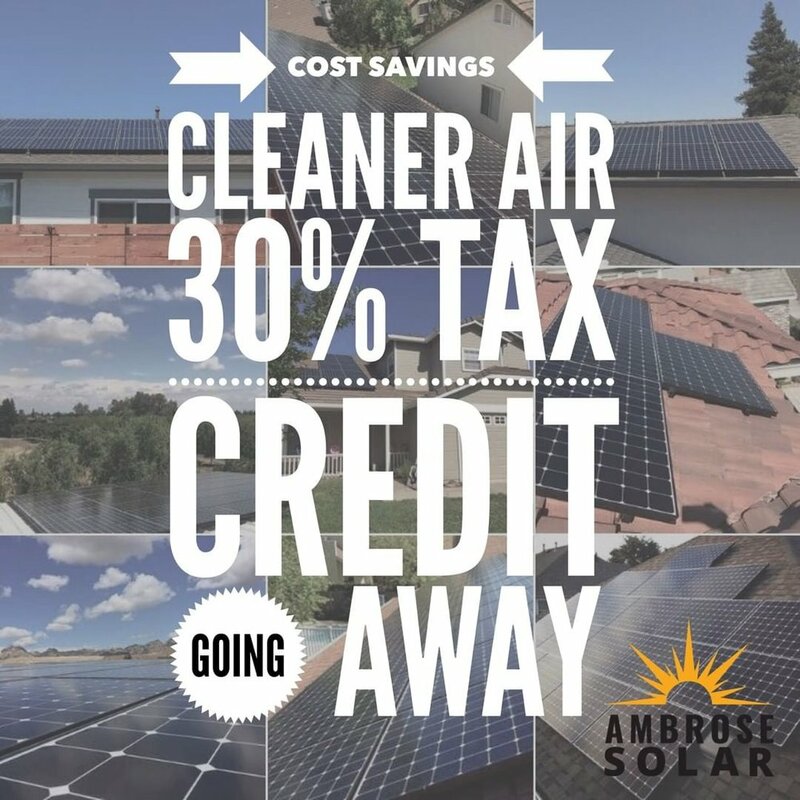 ACT NOW and call Ambrose Solar TODAY! More people in Vacaville and Northern California are having solar systems installed on their roof than ever before. Is solar just a passing fad, or does it really live up to all this hype? Take a look at the many advantages of solar energy and decide for yourself. Each month you have solar powering your home or business you will be putting money back into your pocketbook. Think of all the things you can do with the extra money you save, remodel that kitchen, grow your business or just watch the nest-egg grow. Along with saving money you can rest easy knowing you are doing a good thing for the planet. By reducing your carbon dependency you will be helping the planet to recover from the years of damage we have caused. Hug the planet, go solar today. Do you save for the future? Do you have a retirement plan, an IRA perhaps a 401k? Well by going solar you will have the chance to put the money you save into a retirement account. Not only can you do that but you are setting yourself up to save a lot of money in the future, as electricity prices rise so will your regular utility bill. Going solar allows you to protect yourself from those high bills and when retirement comes you will not have to worry about paying those bills. Sound nice, right. Go solar. Solar energy is a completely renewable resource, unlike coal, oil and gas. When you put solar on your roof and stop getting the power you use from the local electric company you will help offset the use of coal, oil and gas and this will help the environment. Go Solar and do your part to help. Though solar panels have been around for decades, it has not been until the last few years that the technology gurus been able to get the most from the cells. SunPower panels are the most efficient panels on the market today. With the latest panels you can put fewer on your roof to make even more power then just 5 years ago!